When I first started watching you, I didn't know much about you. Most of what I had heard about you amounted to "it's like The Office" (which I love) and "Chris Pratt is in it" (which is also a good thing). So on a day during the Christmas vacation of 2014, I brought you up on Netflix and pressed play. But I was vastly unprepared for how much I would love you. You made me marvel at how kind a story and its characters can be. You are positively full to the brim with optimism and sunshine, and that is something that is so rare these days. But in spite of this, you have never given in to becoming sentimental or overly sweet. You are joyful. You acknowledge that there are hard times in life, but you also acknowledge that we will get through those hard times. Storms do not last forever. You have reminded me that we can keep pushing through these storms. Above all, you are joyful, and I want to thank you for that. Thank you for giving me some of the most quirky and vivid characters that I have had the pleasure of getting to know. Thank you for Leslie Knope and her unparalleled drive to get things done. She never gives up, even though life throws obstacles, pits, and rich people from Eagleton in her way nearly every day. If more people loved life and cared about people like Leslie Knope, the world would truly brighten. Thank you for Andy Dwyer and his never-ending goofiness. Life is a pure adventure to him, and there's something so utterly wonderful about that. 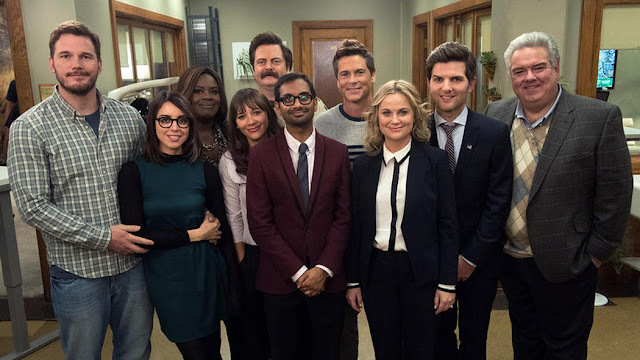 Thank you for Ann Perkins and her quiet but wonderful contribution to the show. She's incredibly relateable, and she fills the show with so much life. She's the softer balance to Leslie that we need. Thank you for April Ludgate and her deadpan humor and wonderful wit. Intelligent humor is something that I am always grateful for, and April gives us as much of that as we want. Thank you for bringing us a character that's quick on her feet and yet doesn't forget how important it is to laugh at life. Thank you for Ben Wyatt, that wonderful, almost overly reliable man. He's unashamedly a nerd, which is what we all are at heart. Thank you for reminding us that being a nerd is not something to be ashamed of but rather something to be embraced. Thank you for Ron Swanson and his brilliant obstinacy. Thank you for his love of meat (and really, just all food). Thank you for his almost unnerving practicality, and thank you for all of the loyalty that he brings to the show. Thank you for Chris Traeger, with his unnatural enthusiasm for... everything. He tries to put a positive spin on everything, and while I'm sure that's exhausting, he makes for a compelling and interesting character. And yes, thank you for even Tom Haverford. Tom learns so much about life throughout you that watching is like watching him growing up. He becomes someone who can love and care about people so much more richly than he could at the start of you, and that is a truly rewarding thing to watch. Thank you for making me laugh. Your story lines are some of the most ridiculously creative that I have ever had the privilege to see. You are a perfect example of what good humor should be; you have taught me so much about what is funny and what kinds of situations can be made funny. Watching you, I have gained an intuition for what comedy can be. But most of all, thank you for being a good story. Once I started, I couldn't stop watching, and I ended up finishing in an embarrassingly short amount of time. You were never boring, and you were a spot of optimistic life within the dark landscape of modern television. From the very bottom of my heart, thank you.